You can attach recare to a patient's record as needed. Note: Manually attaching recare is not necessary. 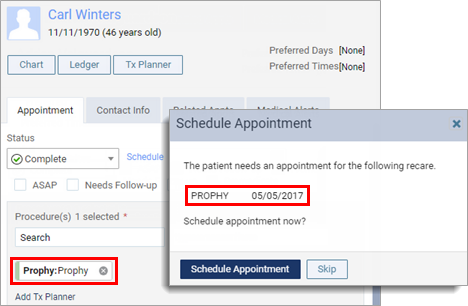 When you post a completed procedure that is associated with a recare type (such as when you are completing an appointment), Dentrix Ascend automatically attaches the corresponding recare to the patient's record, if it is not already attached, using the default settings for that recare type. On a patient's Recare page, click (or tap) Add New Recare. The options for attaching recare become available. Select the Type of recare that you want to attach to the patient. Change the default Interval for the selected recare type if necessary. Enter a number, and select Weeks, Months, or Years to specify how often a patient with this recare type attached to his or her record should be seen for this type of recare. The Due Date is entered automatically. 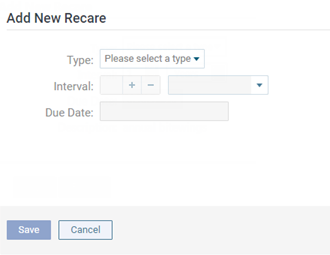 When you complete an appointment with a recare type attached, the due date for the patient's next recare appointment (of this recare type) advances by the specified interval, and a message appears and asks if you want to schedule the next recare appointment. Click (or tap) Schedule Appointment, and then schedule the appointment.